Two days of rest appeared to do a world of good. The weather on March 3rd was rather dismal. Jens went off to the airport for 3 days in Copenhagen with leaden gray skies and a threat of rain. We’d had rain through the evening of one of my rest days that impacted the already rapidly disappearing snow. Without the crisp white blanketing the winter sere grass, gray days become even more drear and uninspired. It was roughly 38 F out. A bit of the wind stirred around, but nothing that I was dreading. Loke was raring to go. He especially seems to like the fact that he’s allowed to run a little now. We’d barely gone 200 yards when the first little spits of rain hit, just a faint misting I could feel on my face and speckled my glasses when the wind carried it under my brim. The first climb to cross over the 55 left me feeling a little frustrated. It didn’t really feel any better than it had before. Loke helped, bless him. His reward was a bit of a 11 mph lope down the long hill to the bridge across the river. He took advantage of it and even tried to pull for 12 or maybe even 15 mph! As we made the turn to head into downtown Uppsala, it became clear that though things didn’t feel any better, they were. The reason it still felt hard was because I was faster. Stretches where I had struggled for 4 mph, I was grinding along at 5 or even 6 mph. When stopping for Loke’s ‘business’ or to wait on traffic at crossings, the exhaustion in my legs drained away quickly. The drizzle stayed with us, though sometimes it was more of a light mist than a sprinkle. It never quite came down hard enough to so much as dampen my clothes, for which I remained grateful. As we passed the bandi court for a little extra distance, what should I see? Street sweeper! Loke gave me a baffled look as I cheered at the sight of it, running along a sidewalk and gobbling up all the gravel spread out on the now-gone winter ice. It seemed a fairly limited project though. That was the only sweeper to be found through the rest of Uppsala. I’d actually had a specific reason for my downtown trip. There’s a cute little kitchen shop call La Cuisine right next to the river. A couple years ago, I spotted an adorable cast iron teapot there which I almost bought for Jens as he likes tea. I changed my mind about it because though he likes it, he doesn’t drink it often. Well, now the determined hater of tea (me) is working on coming around. Yes, I grew up in the southern U.S. and I hate(d) tea, especially sweetened ice tea. Worse when it has a twist of lemon in it. Blasphemous, I know and such words uttered on the Mississippi Gulf Coast would likely get me lynched. All through the southern states, sweetened ice tea is a staple as people relax in whatever shade to be found through the intense heat of the summers, sipping said beverage. Yet, here I am, now drinking tea. I’ve been trying the ones with some kind of health benefit specifically. So far, my favorite is Rooibos of various flavours. As I’ve warmed to the teas, I wanted one of those tea pots. It has a lovely little strainer basket that fits inside. Cast iron covered in dark, navy blue (almost black) matte enamel, so it helps keep tea warm and just big enough for a couple cups. The woman was surprised when I said I didn’t need a bag. “Are you sure? It’s raining!” I assured her my cycle bag was waterproof. Loke had waited for me with sublime patience (read boredom). He woofed at me as I wrestled that quite heavy little teapot into a bag and zipped it closed. I could feel a difference in the pedals with that extra weight. Then I proceeded to baffle Loke as we doubled back a bit for a stop at the outdoor shop. I left him waiting again, this time in hopes he’d be a deterrent to the beggars gathered outside the shop from digging around in my bags. So, even though Loke is allowed into that particular shop, he stayed with the trike as I darted in and straight to the hat section. Took me about 5 seconds to find exactly what I was looking for. A very light weight beanie. I have a nice Gore-Tex hat for very cold weather and a red sort of knit hat for moderately cold weather. I needed something for chilly weather when not quite warm enough to go with a bare head under my helm. I was in and out in less than 2 minutes with a much happier head. There was only one more stop after that. I stopped in at the American Food Store for more bagels for Jens. I was naughty and bought a Welch’s strawberry soda for myself. Then it was onward to home! We arrived back at the storage with 9 miles on the nose. Not the longest ride of the year, but close. Best of all, I felt pretty good. Better than I had on the rides a week before in the 4.5 mile range. Those had nearly killed me. Here, with double the distance and all was good. I probably could have pushed on for an extra half mile to have made it the new official ‘longest post-stroke and 2015’ ride, but better to end on a high note than risk overdoing it. Wednesday, March 4th was a rest day. Thursday, the 5th I planned to ride. It almost didn’t happen. I went to the gym that morning to work my arms. Just as my last set was finished and about to start a 3rd, I felt my blood pressure drop which left me sick and nauseous. I made it home and curled back up in bed for a few hours. Feeling a bit better, I got up around 11 am. It was pretty out and Loke starting being a pest. It gave me the ‘oomph’ to actually drag on several layers for a ride. It was on the warm side of things, which turned out to be pretty good as my footwarmer batteries ran out of juice sometime during the outing. I zigged and zagged my way through Uppsala again, this time to do a quick stop at a fabric store downtown. I have an idea to make padded canvas bags for the rear wheel and front boom of my trike during transport. This ride, I actually had some time on swept streets and trails. It made a world of difference to the effort required. They need to hurry up and get it all done! Some places in Uppsala are quite challenging to ride, not because of cars, but pedestrians. One street is exclusively a walking street. Another, pedestrians have right away even in the middle of it. The second is easier going for bikes, but still a bit of gauntlet. Finding a spot to stop outside the fabric store was hard. The fabric store was packed full of people going in and out and throw in there’s a bus stop right there at the door as well apparently makes it a beggar prime spot. 3 women sitting on the sidewalk, wailing, ‘Please! Please, money!’ One of them even plucked at my arm as I passed. I didn’t want to leave the trike too long, so it was a quick run through the shop, finding very little. From there we just pushed directly for home with no other stops. Arrived at the storage with 9.8 miles making it the new longest. I was pretty pleased with it. It hadn’t been easy. Significantly harder than the 9 miles on the 3rd, but it didn’t completely kill me like the much shorter rides the week before, so I counted it all good. Clearly, Friday, the 6th was a rest day. Woke in the morning to the sounds of sweepers on the road behind our apartment. Gave me a huge smile. I couldn’t quite decide what to do about Saturday. I’ve been feeling so determined to get out and the fact it was the weekend made it harder. It was actually Jens encouraging me to do a 2 day rest that leaned me in that direction. He suggested we go to the city forest to walk Loke as a ‘light exercise’ for me. That turned a little exciting when we discovered the inner trails still heavily iced and very slick. I walked in the squishy leaves and mud, stepping over branches and roots as I’d not worn my Ice Bug boots. Jens slipped and skidded on the ice rather than face mud. We were barely out for 15 minutes, it was that bad. Other than the ice was the wind. It roared. It howled. It caught the edges of random items and gave mournful whistling cries so much like when we kids used to blow across the mouths of bottles to make those hollow toots. The thermometer might have said 40 F, but the wind had teeth of ice that ripped warmth away and left one breathless. Oh, and there was no sun too. No, definitely didn’t want to ride in that. Sunday came around, dull and leaden. Jens bugged me to go ride. I was reluctant. Firstly, because the wind lingered on. A glance out the window was a view of the slender, hanging limbs of birch trees lashing and snapping like bullwhips. Even with the windows closed, the rushing roar of it was astounding. Part of my reluctance came from looking at the forecast. Monday was supposed to be 55-ish F and clear with half the wind. If it turned out that pretty, I wanted to be fresh enough to go out into the countryside. For once to escape the River or Uppsala Loops. But my husband insisted. I grumbled, ‘If a tree falls on me while I’m doing this, it’s your fault’. I also announced it was going to be short because I hoped for a longer ride on Monday. I was glad to discover I felt stronger again. Even directly into a wind of 25+ mph, I didn’t feel like I was going to fall apart. Wasn’t fast, but could keep moving. About mile 2, the sun peeked through the clouds. 10 minutes later, there wasn’t a cloud to be seen and my Garmin displayed 50 F. Suddenly, those extra layers of wool were way too much. Even stipped off my gloves and the beanie from under my helmet. We arrived back with the usual 4.4 miles. Felt it only a little in spite of the hindering wind. The fact it was mostly sunny for the rest of the day made me a little peeved with said wind. Being so pretty out just made it feel like such a waste to not be riding, but as blustery as it was in Uppsala with trees and buildings to break it up, I didn’t want to find out how ferocious it would be out among the fields. Monday dawned beautiful as promised though in the early hours, it was colder than forecasted. Even so, looking out at the dawn sky of deep dusty blues, pale rose and gold filled me with anticipation. How to dress was a thorny question. Dressing for the cold would mean roasting later. So, I decided to wait until the sun was well up. About 9 am, I was dressed and walking out the door with Loke. The sky was a smooth, unbroken dome of azure that graduated to shades of robin’s egg at the horizons. The sun came down warm in its unhindered glory. There was one flaw with the day. Wind. Not as raging as the two previous days, but persistent and significant. For a guess, I’d give the wind speed as 15-20 mph. A distinct improvement over 25-30+ mph, but not a cake walk. As I set out on the usual start of the River Loop, I weighed my options. 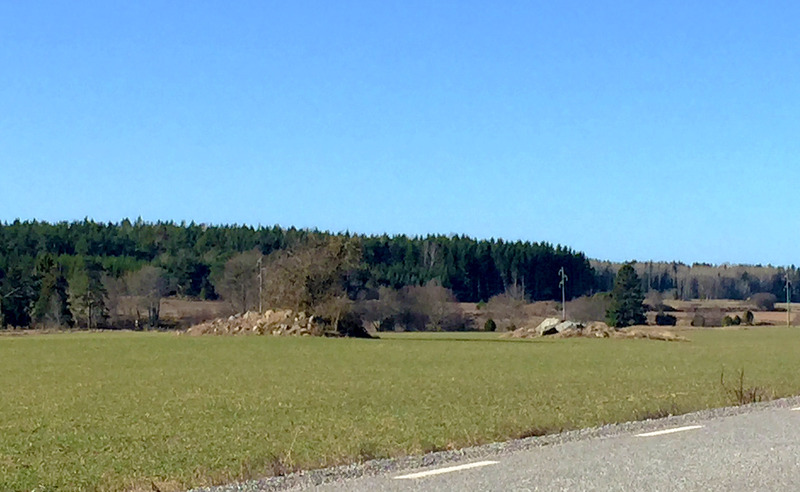 A decision eluded me until I stopped at the intersection of new Börje Road and Old Börje Road. Loke watched me, bright eyed and his tail wagging slightly. What decided me was looking up. That gorgeous sky lacking the least little hint of any clouds from zenith to all horizons. Days like that are rare. It was not to be wasted even if it meant creeping along, buffeted by wind in the open countryside. I had laundry that evening, but I’d just have to deal with it because the day was not going to slip by with the bulk of it indoor. Just wasn’t going to happen. Loke was thrilled as we scooted across the 272 to start up that first hard climb. He’s been so very bored with the current loops. Spring just might be here! It took all my will power to not push for speed. I resolved to simply keep the pedals turning as smoothly and easily as possible even if it meant crawling along at 3 mph. The goal was to enjoy the day. Take delight in my surroundings! After his first ‘yay’ moment, Loke quickly settled. He didn’t pull though he jogged or walked along with interest in his surroundings. I had the impression he was feeling his age. The looks he gave me when I’d ruffle his fur made me laugh though. The side-long glance and canted ear that might have been saying, ‘Excuse me, I’m working here. No place for that at work,’ if he’d been human. I always love my furry cycle partner, but my heart sings with it all the louder when he’s beside me on the trike. The wind buffeted us around a bit. A few times, I was a little worried about my flag pole though it wasn’t flailing as furiously as on Sunday. My Garmin registered temps around 50 F.
In spite of the wind and the ride from the previous day, I felt pretty good. All was right in the world. Loke did summon enough energy to gently lope along down some of the hills. He used to be a speed demon on these hills in his prime, but we all age. As long as he’s happy, all is good. After the first photo of the lovely day, I mentally kicked myself a few times for not bringing my Canon. The iPhone 6’s camera is respectable, but technology hasn’t yet bridged the gap between phone cameras and proper SLRs, digital or analog. Not to mention the quality of a proper lens zooming. Of course, these are just photos of areas I’ve snapped dozens of times before only on a different day. I found myself longing for my Canon regardless. The sunshine lulled me into a false sense of fitness. A couple nice drivers stopped and motioned for me to scoot across. In moments, I was climbing that first hill at a snail pace. Comfort was to be found in that we were headed into the wind as we headed toward Börje. It meant a tailwind on the return to Uppsala. I focused on enjoying the day, being out in the sun with blue skies and a hint of green already spreading across the fields. Over the soft roar of the wind across my ears, I also listened hard for meadow larks. The snow is gone and yet the larks are scarce. It might be too early for them, I guess though they’ve surprised me in past years by their presence even when snow blankets the fields. I did hear one or two, but in such weather I’d have thought there’d be dozens. Since a friend of mine posted a photo of bloomed dandelions, the search is on for the first crocus of the year. I scanned the ditch edges in places I’ve spotted them before, but no luck. Nor had I seen a single snowdrop which is very surprising as the sprouts of tulips and daffodils were spotted weeks ago. Their growth seems to have stalled though. The entire ride became 14.4 miles. It would have been around 12.5 miles, but a whim took me to push on into the heart of Uppsala. No particular reason. I just wanted to. The Great Sweeping of 2015 has proceeded a pace and more and more of the streets, walks and cycle paths are wonderfully smooth. There is a downside to that. With the ‘Great Sweeping’ comes ‘Days of Dust’. All the gravel put down to give traction on packed snow and ice gets ground hard between tires and asphalt as the melt comes. When it dries out, it can billow with every gust of wind or passing vehicle. The sweepers/vacuums pick up the gravel, but can’t do much about the dust which gets really crazy once the pebbles are gone. I frequently cover my face with an arm when I see a bit puff of it coming my way. The past few rides in such gorgeous weather with complete lack of snow except in the most shaded and hidden thickets has had me dreaming of summer tires. While rolling along beside the river in central Uppsala, running high as the last of the melt water drains away, I decided to ride again on Wednesday, rest on Thursday and Friday. I have a doctor’s follow up post-stroke on Friday which makes it easier to not stress about riding that day. On Thursday, I’m going to change the tires which will need a recovery period as well. I’m sure as soon as the winter tires are off, we’ll get some freak freeze with about 2 feet of snow. If we don’t, all I’m doing is wasting my studs on pavement. After a rest on Tuesday, today rolled around (March 11th) and I got ready to ride. I could tell it was going to be a short one though. My legs still felt the effects of the Sunday/Monday 19+ mile double whammy. At least Loke seemed to have completely recovered and then some. He was raring to go as we set out on the River Loop. Today was a colder copy of Monday. Cloudless skies and breezy. Instead of 50+ F, it hovered around 42 F. I felt every bit of the wind, both last ride and this one. Oddly, my legs felt stronger, but just sooooo tired that it was hard at times to keep the pedals moving. After several days without rain and the sun surprisingly warm, the road dust was blowing everywhere. Turned into veritable blinding clouds when cars passed. Even with sunglasses, grit got into my eyes a couple times. The day’s rest seemed to have majorly rejuvenated Loke. He wasn’t a husky. He was a fur covered powerhouse. At least the wind was firmly at our backs after about half the ride so getting back to the storage was easy. And now, I’m going to try and savor the two days of rest. I’ll probably be twitchy and staring mournfully out the windows as the next 5 days or so are forecasted for more of these cloudless skies and temps between 40 or 50 F. I’ll hopefully be able to hold out, knowing if I wait until Saturday, I’ll hopefully be stronger and recovered enough to go for a real ride! I’m just glad I started improving. It was getting very frustrating there for a while! So, that’s a week’s worth of rides (+ 1 day) in a single post. I need to type faster, don’t I?